115. Baumann, Walter. 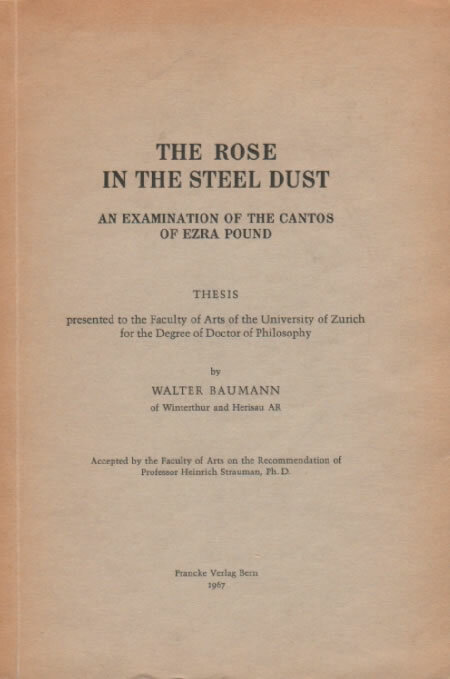 The Rose in the Steel Dust: An Examination of The Cantos of Ezra Pound. Bern: Franke, 1967. Reprint, Coral Gables, Fla.: U of Miami P, 1970. A close reading of especially cantos IV (31) and LXXXII (56g). Contains cogent analysis of Pound’s use of legends associated with the pines of Takasago and Ise (p. 39-41; see especially 31, 70c, and 88d), his incorporation of nô materials (pp. 74-78), and in both cases how he used these Japanese subjects to establish a counterpoint to European values derived from classical Greece.